The RCMP say Mr Solis-Reyes then stole 900 social insurance numbers. In a separate development, UK parenting site Mumsnet has provided fresh details about how it fell victim to the bug. The site has published a post explaining how a hacker hijacked several accounts last week - including one belonging to Mumsnet's founder Justine Roberts - after exploiting the cryptology flaw to expose the owners' credentials. "I hope the actions of hijacking Justine's account help draw attention to how big a deal this is," the hacker wrote on the social network. "I suspect a lot of people would not have taken it seriously otherwise. Be thankful that the person who got access to the server information was kind enough to let you all know (and at least try and be funny with it) instead of simply sitting on the information." The Heartbleed bug was made public a week ago by Google and Codenomicon, a small Finnish security firm, which independently identified the problem. The bug exploits a flaw in OpenSSL - a cryptographic software library used by services to keep data transmissions private. 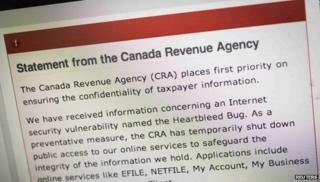 Canada's tax agency was one of the first major organisations to cut services as a result the security flaw. However, the action came too late. "It is believed that [Mr] Solis-Reyes was able to extract private information held by CRA by exploiting the vulnerability known as the Heartbleed bug," the RCMP said in a statement. He is expected to appear in court on 17 July 2014. Security experts warn that more attacks could be revealed soon, as firms and governments work to determine whether or not their systems are vulnerable.